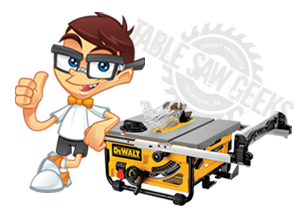 Dewalt are one of the leading manufacturers of table saws. If properly cared for, your new tool will serve you well for many years. Regularly tuning up your saw will also allow you to carry out woodworking jobs as safely as possible. How Often Do You Need Tune Up Your Table Saw? Since DeWalt table saws are manufactured to a high standard and are designed to be durable, the machine’s maintenance needs should be fairly minimal. 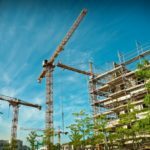 You will normally know if some tuning up is needed because you will start to notice some minor flaws in your woodwork. Cutting wood or timber too slowly can lead to burn marks. However, if you are sure that you have been using the right cutting technique then the burns may be an indication that the blade is misaligned and must be corrected. 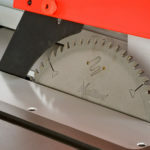 If the blade starts to remove a little more wood than desired at the end of the cut – which can sometimes be accompanied by a shudder or metallic ringing sound – it might also be a sign that maintenance is needed. If you suspect that there is an issue with the blade you should observe it carefully. The blade should be perfectly straight and flat. If it is not then you will need to replace it. You should also check that the poor quality of cut is not being caused by a blade which has dulled or by debris lodged in the mechanism. Once you have ascertained that the blade itself is fit for purpose, check whether it is properly aligned. It should be completely parallel to the mitre slots on the machine. 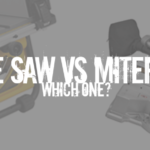 There are subtle differences in how table saws need to be adjusted if the blade is misaligned, so if this seems to be your problem you should look in the DeWalt operating manual and follow the instructions exactly. After aligning the blade, turn your attention to the rip fence. This should line up neatly with the blade (which should now be perfectly parallel to the mitre slots). Place a straight edged tool along the length of the mitre slot and move the fence until it is resting against it. This will tell you if the fence is properly aligned with the blade. If you notice any gaps between the straight edge tool and the fence, make the necessary adjustments until they are completely flush. The last part of the table saw to check is the throat plate. This should either be totally level with the table or slightly lower. If it protrudes at all, the raised plate can get in the way of any wood or timber which is being pushed through the saw. Use the screws on the plate to manoeuvre the plate so that it is in the right position.